Larry Ellison has opened a new front in his battle with Cisco Systems and EMC, launching new Oracle hardware on Wednesday that he claims will be the cheapest on the market. 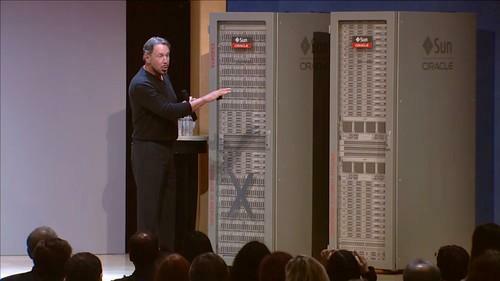 It's a big change for Oracle, which has always emphasized performance over price. And it's a tacit admission that Cisco and EMC may have read the market better. The purchase price of Oracle's hardware has sometimes been an "impediment" for customers, Ellison said. The vendors all sell converged systems, which combine servers, storage, network and software into pre-built systems that can ease set-up and yield faster performance. But while Oracle has built big, powerful systems with price tags to match, Cisco and EMC, through a joint venture called VCE, sell systems that can start small and are built around lower-priced, 2-socket x86 servers. That's not to say they're cheap, but they're cheaper than what Oracle has to offer. Those two socket servers are now the biggest trend in data centers, Ellison said Wednesday, admitting that Cisco and EMC have been "very successful." "They aren't close to us on performance," he claimed, "but they delivered a very low purchase price." So Oracle is fighting back. "We have a new strategy," Ellison said. "We're going to compete for that two-socket data center core business. And from what I can tell, the way to compete is to have the lowest price." Ellison gave up his CEO position at Oracle last year but shows no signs of reducing his role there. He's now CTO and executive chairman. He introduced several updated systems in a family called X5, Oracle's fifth generation of hardware since it bought Sun's server business. The systems will be available later this year, an Oracle spokeswoman said. The company didn't provide spec sheets but Ellison said they include newer components, including the latest Intel processors, and improved software. An updated Virtual Compute Appliance, with 27 two-socket servers and two Oracle Virtual Network interconnects, will have a list price of US$562,000. He claimed an equivalent Cisco UCS system with M4 blades is priced at $912,000. Cisco didn't comment directly on the pricing but said it feels "pretty good" about its position in the converged infrastructure market. "This is a market Cisco created with EMC back in 2009 with a joint venture that become one of the most successful in IT history," Cisco said in a statement. NetApp, Red Hat, Hitachi Data Systems and IBM have made Cisco UCS the "system of choice" for their integrated infrastructure offerings, it said. "Oracle has a lot of catching up to do. Ellison also announced updates to the Oracle Database Appliance, Oracle Big Data Appliance, Zero Data Loss Recovery Appliance, and Exadata Database machine. The latter gets faster processors, 50 percent more memory and, for the first time, the option of an all-flash storage server. Oracle's hardware systems have always offered low ownership costs, he argued, but customers pay more attention to the up-front purchase price and don't always see longer-term savings. "We're tired of having this argument," Ellison said.